Citation Information: J Clin Invest. 2016;126(8):2893-2902. https://doi.org/10.1172/JCI83676. Joints that have degenerated as a result of aging or injury contain dead chondrocytes and damaged cartilage. Some studies have suggested that chondrocyte death precedes cartilage damage, but how the loss of chondrocytes affects cartilage integrity is not clear. In this study, we examined whether chondrocyte death undermines cartilage integrity in aging and injury using a rapid 3D confocal cartilage imaging technique coupled with standard histology. We induced autonomous expression of diphtheria toxin to kill articular surface chondrocytes in mice and determined that chondrocyte death did not lead to cartilage damage. Moreover, cartilage damage after surgical destabilization of the medial meniscus of the knee was increased in mice with intact chondrocytes compared with animals whose chondrocytes had been killed, suggesting that chondrocyte death does not drive cartilage damage in response to injury. These data imply that chondrocyte catabolism, not death, contributes to articular cartilage damage following injury. Therefore, therapies targeted at reducing the catabolic phenotype may protect against degenerative joint disease. Measuring chondrocyte density and number. (A–F) 3D reconstructed images representing a 760 μm × 760 μm × 50 μm volume containing a DAPI-stained, wild-type femoral head. The centroids of individual chondrocyte nuclei in the entire cartilage volume (A) and in a volume extending to a depth of 10 μm below the surface (C) are indicated by yellow dots. The cartilage volumes across the entire thickness (B) and within the most superficial 10-μm region below the surface (D) are colored yellow; the volume covered by the yellow volume in D is colored blue (inset, D). (E and F) Centroids of chondrocyte nuclei in 100 μm × 100 μm areas (boxes) at depths of 10 μm (E) or 20 μm (F) are indicated by yellow dots. 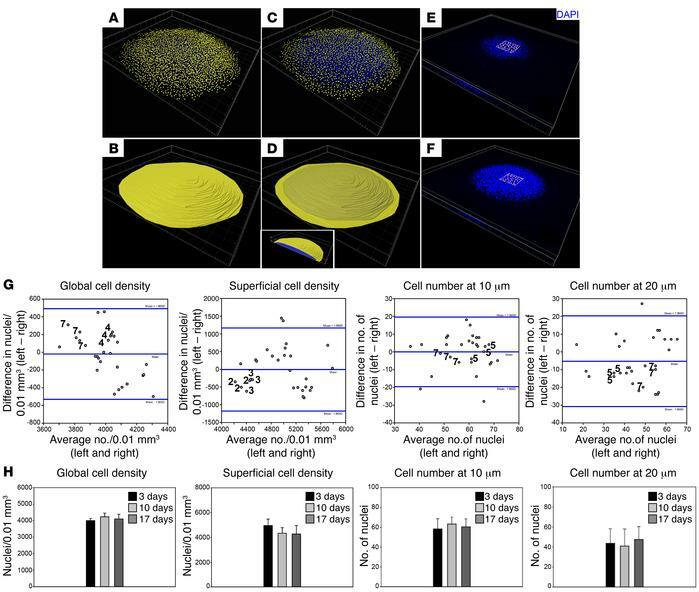 (G) Bland-Altman plots comparing measures of cell density (number of nuclei/0.01 mm3 cartilage) across the entire cartilage volume (global cell density = chondrocyte nuclei counted in A divided by cartilage volume as calculated in B), the surface volume extending to a depth of 10 μm (superficial cell density = chondrocyte nuclei counted in C divided by surface volume as calculated in D), and cell numbers in the center 100 μm × 100 μm areas at 10 μm (E) and 20 μm (F) depths for the femoral head. Each circle represents a comparison between contralateral joint surfaces (n = 10 mice and 3 comparisons per mouse). Note the circles from an individual mouse cluster near one another. Numbers indicate the median mice with regard to average cell numbers. Blue lines indicate the mean ± 1.96 SD. (H) Graphs depicting the mean (+ SD) values of the 4 primary measures for the femoral head obtained after storage in fixative for 3 days, 10 days, and 17 days. No significant differences are attributable to the length of time in fixative.